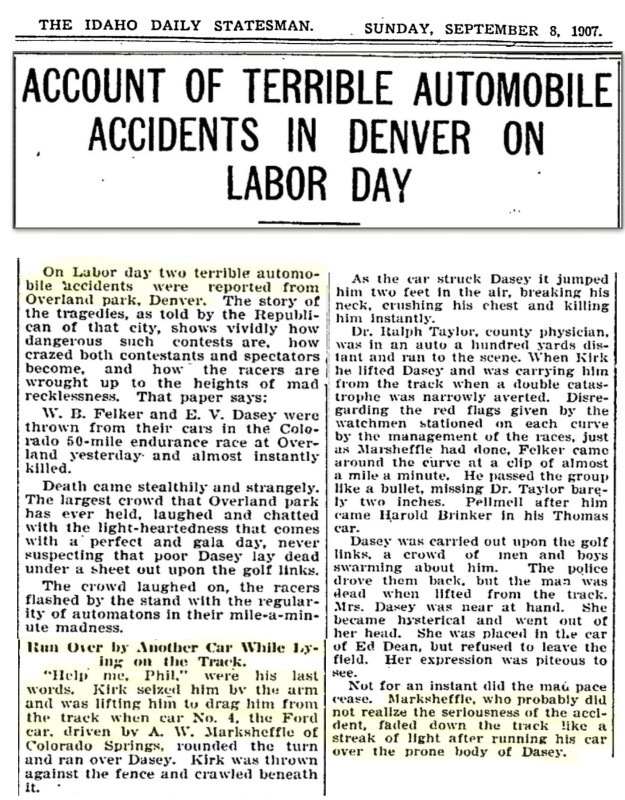 The next two accidents drew national attention, probably as much due to the salacious events leading up to the tragedies as the tragedies themselves. 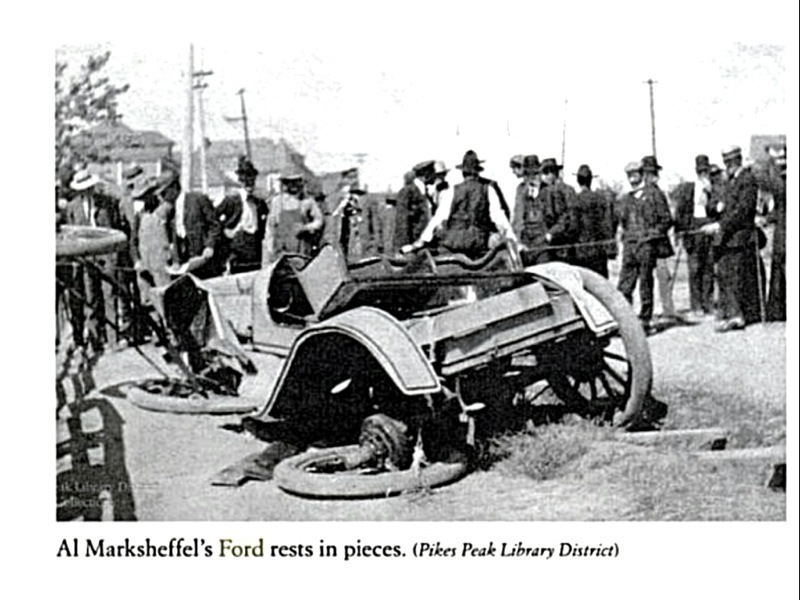 Both involved Ford's new "6-40" K runabout, and involved excessive speed. 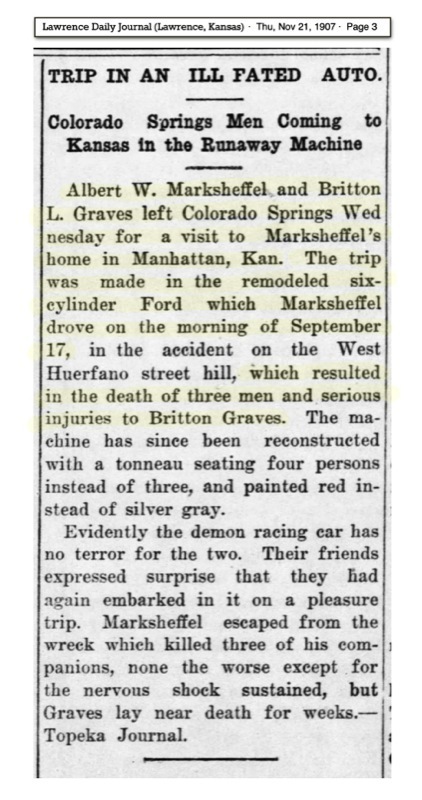 This is not the accident that will receive national attention, but does introduce us to Mark Marksheffle and his Ford "six-forty." Nasty. Some interesting reporting also. So was it eight or nine men jammed onto that car? The societal shifts surrounding technological leaps are interesting. While people of that time tended to be far more aware of their own personal risks and responsibilities, they also were quite unaware of the severity of many of those new risks. 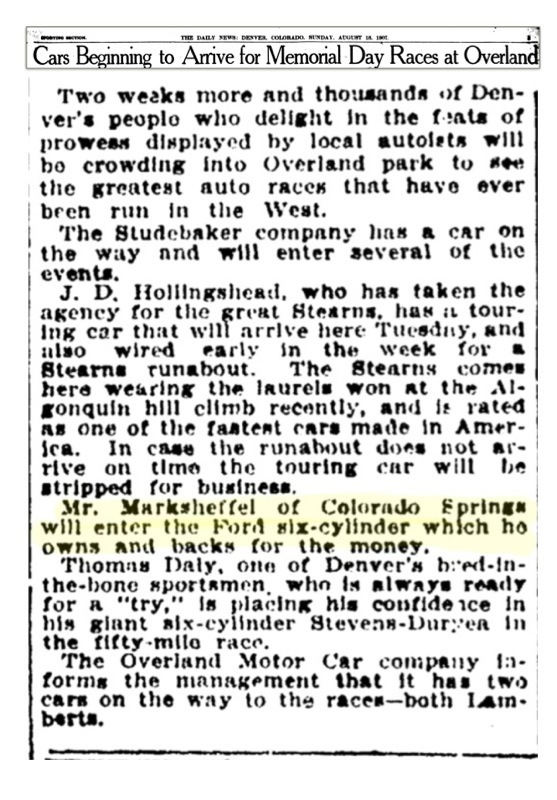 Factory machines and belts could literally shred a man in an instant, and had been around for nearly a century by then. 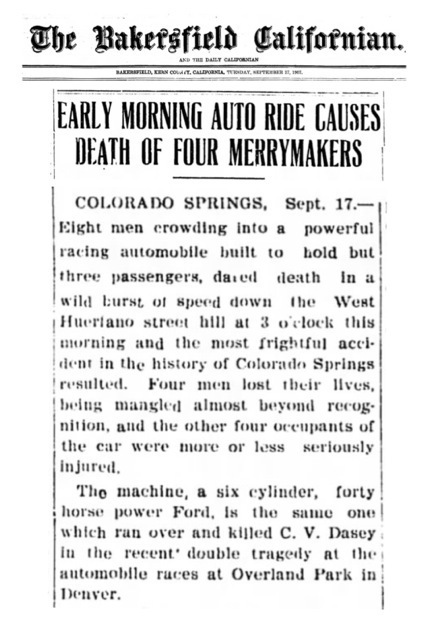 However, at the time of this accident, most people had very little experience with travelling much faster than an average horse could run (roughly 20 mph). The idea, the fact, that risk and damage potential go up exponentially with speed was not well understood. While train wrecks and shipping accidents could be spectacular and claim so many lives? 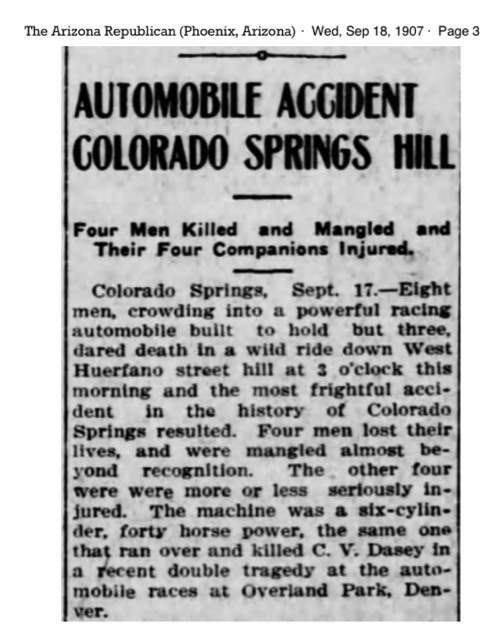 They generally were not so much speed related. Prior to the 1890s (merely fifteen years before the era we are now talking about), the vast majority of trains rarely ran much over 40 mph. I could probably look up the exact year and specifics, but cannot at this time. 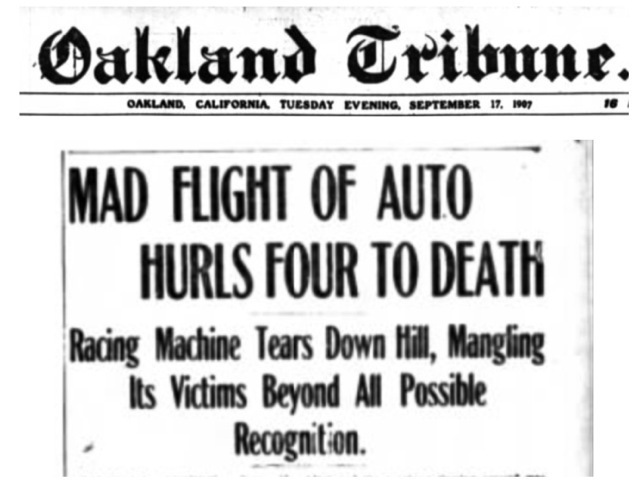 It is interesting to note that one of the major annual automobile races in Europe was suspended after so many spectators were hit and killed because they simply stepped out in front of oncoming racers to get a better look. 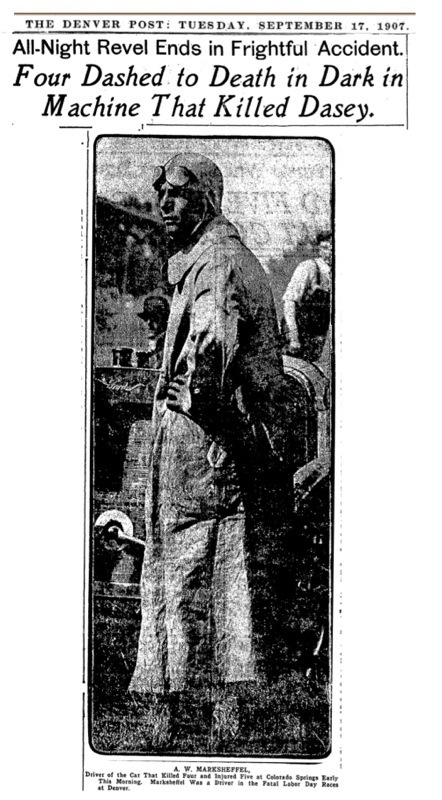 I believe it was the Grand Prix about 1903, but could not find it quickly on Wikipedia. FWIIW. 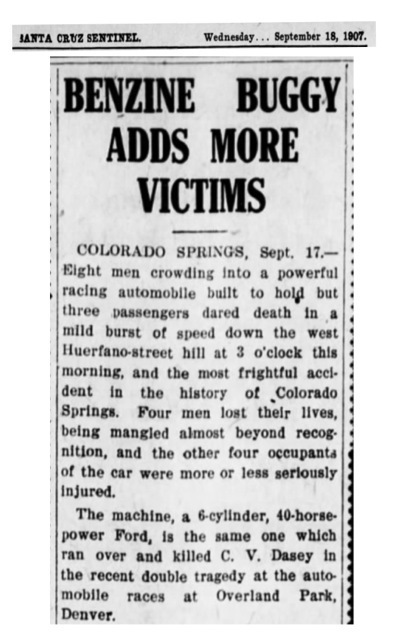 My personal connection to some of this technological growth and danger is that my great great grandfather was one of the survivors of the Sultana riverboat explosion in 1865. 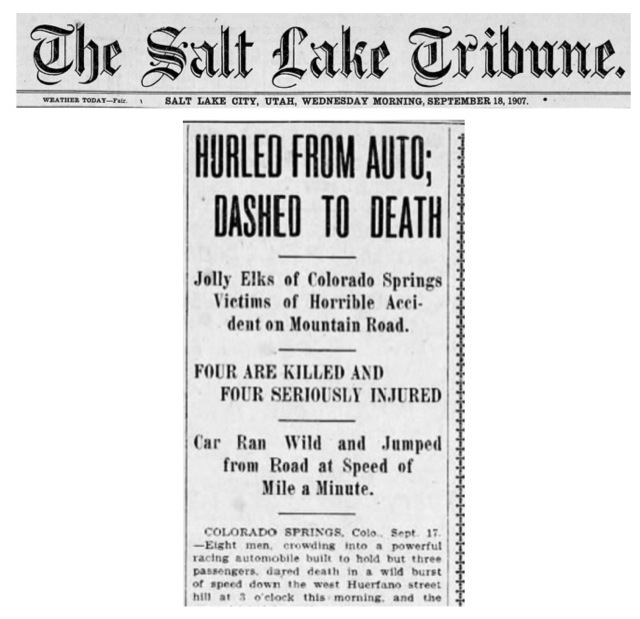 And the event that sent my grandfather's family to move from Tennessee to Califunny about 1900 was a close friend and family member being mauled and killed in a factory accident in Tennessee. Interesting (if gruesome) thread Rob! I can understand if they were all drunk, but you state they were busy involved in other pursuits that night. Dave, My guess would be that one of those "pursuits" was getting drunk! 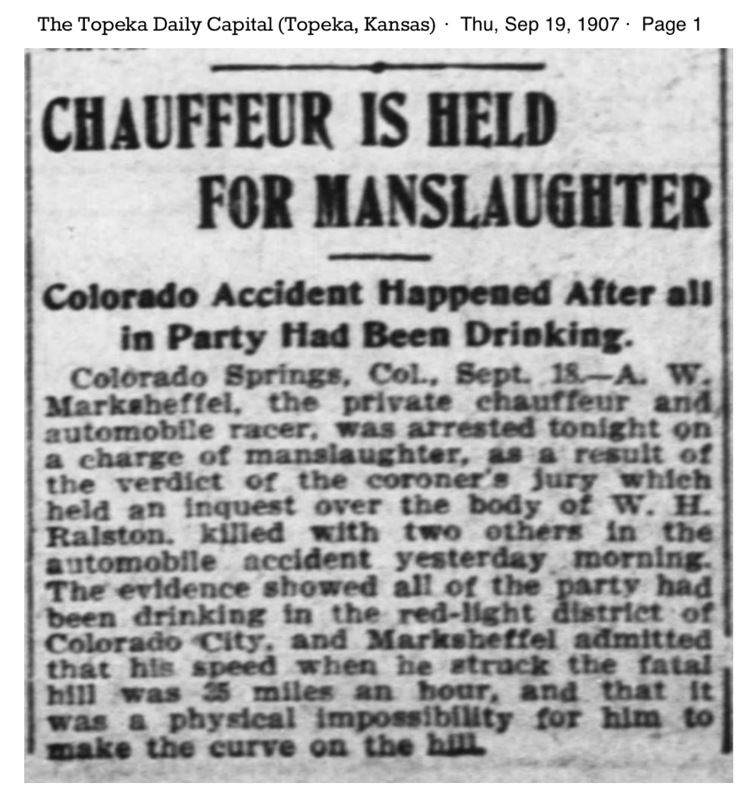 Prior to the automobile, getting drunk was not generally considered to be particularly dangerous. 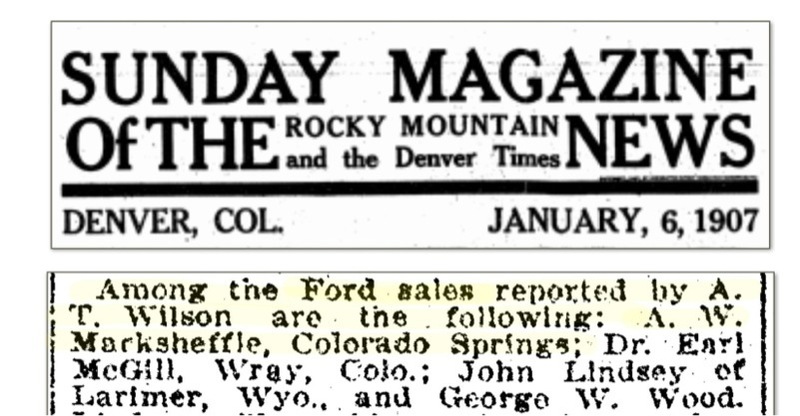 In some ways it appears early automobiling held similarities with the recently ended wild west. 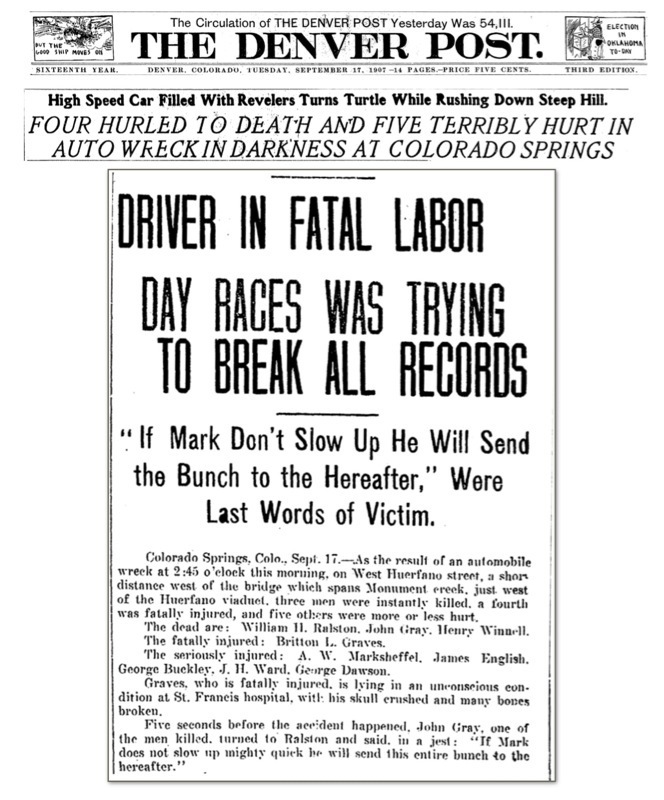 It also seems, as you pointed out, that spectators were at risk and often injured or killed during races. 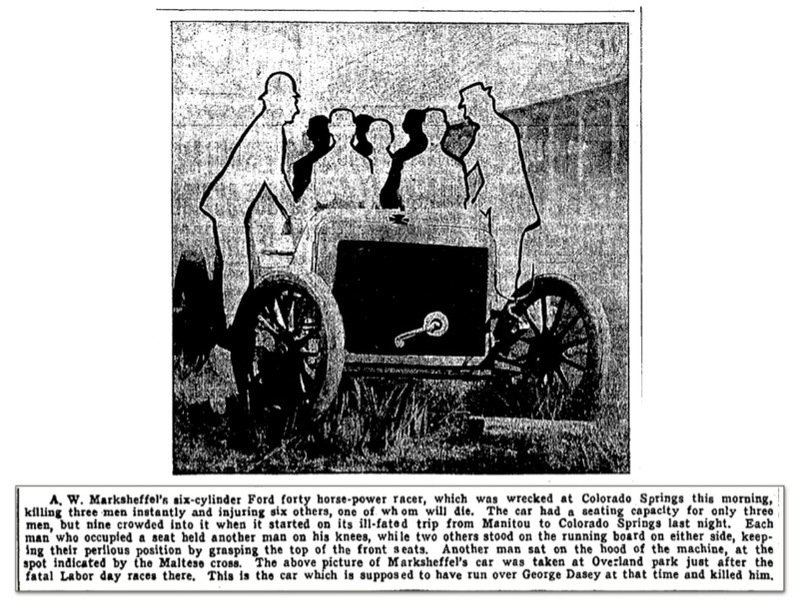 I believe the 1907 Vanderbilt Cup Race was cancelled because there wasn't a good plan for crowd control and safety. times have changed, even going to see loose women is dangerous now too! Eight? Nine? Not your error Rob. While a few of the articles you posted are ambiguous as to the exact number of people in the car, a couple clearly state that nine people were in the car. Yet another gives a precise count of three dead, one dying (actually did survive however), and five injured, for a total count of nine. One article listed names, I only counted eight. 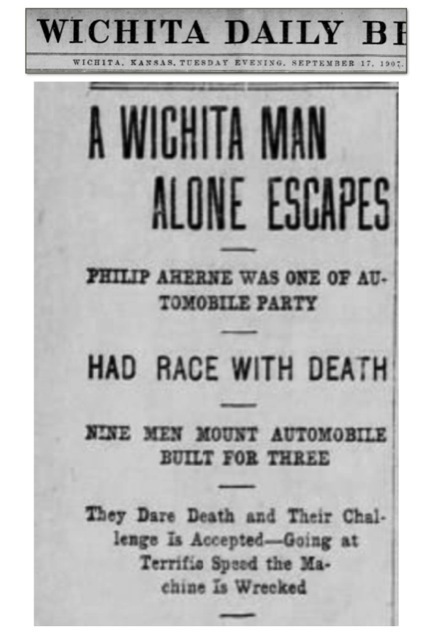 Several other articles stated that eight men were involved. Just typical errors in reporting. That is why we need you Rob! To help find for us, the truth. And do drive that 6-40 K roadster carefully once you get it back together! 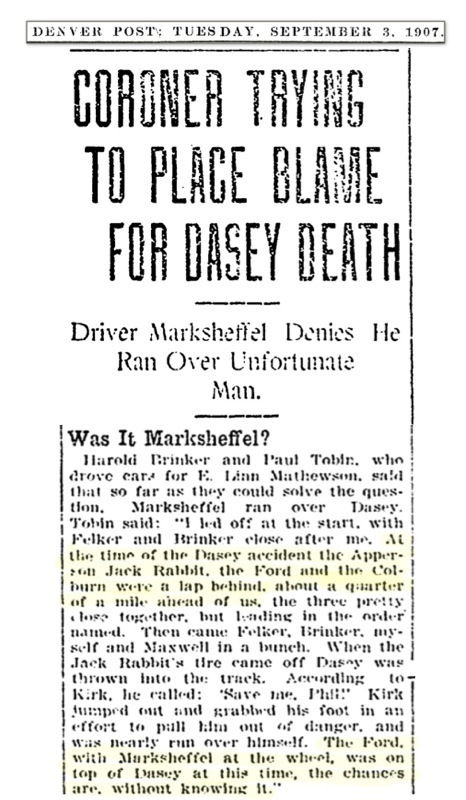 I wonder if Mr Marksheffel got the message after two terrible crashes and lived quietly to old age? It looks as though there were nine in the silhouette drawing above (I forgot about the Maltese cross for the man riding on the hood). Marksheffel didn't change his stripes. He appears to have lived on the edge long after this accident. He even married a "black widow" who was amours in her own right (with a book written of her exploits and demise).